If you have a new flanged stove with a fancy catalytic combustor in it you will need one of these. While I have a newer EPA woodstove it isn't one of these so my choices were among the next three. Don't know much more about them as I didn't need to know beyond that I can't use it in my stove. This type of thermometer lies on the top of the woodstove. Often it also has a magnet in it as well. It works by estimating the temperature of the stove by the temperature of the stove top. This type of thermometer is attached magnetically to the stove pipe, generally at least 18 inches above the stove. It can only be used with single walled stove-pipes. 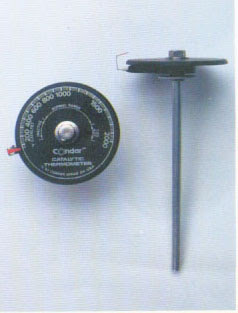 A probe thermometer (see the picture above) looks something like an oven meat thermometer, and is inserted in a hole at least 18 inches above the woodstove. It is the only type that can be used with a double-walled stove pipe. I installed the flue gas probe thermometer. I have a double-walled stove pipe so the magnetic stove pipe thermometer drops of the list. As for the stove top thermometer - the whole idea of estimating the temperature based on siting on the stove or attached magnetically to the stove or pipe just doesn't sit right with me. Having a probe right in the flue gas just seemed so much more comforting or should I say exacting. And the price differential was not that great - for an extra $5 or $10 dollars I was able to get the Flue Gas Probe thermometer. I believe I paid in the order of $25 for the probe thermometer.